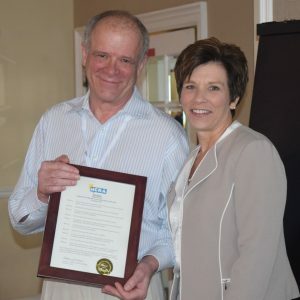 In conjunction with the Certified Legal Video Specialist (CLVS) Fall Event, held at the NCRA offices in Reston, Va., NCRA’s CLVS Council launched an exciting and long-planned project. Rather than offering training to prospective CLVS candidates, NCRA and the council members opted to spend the weekend capturing the contents of the seminar with the goal of bringing the majority of the three-day program online. Typically, the CLVS Council travels two or three times a year to offer the three-day seminar and production exam testing required for the CLVS certification. With this in mind, the National Court Reporters Foundation offered space in NCRA headquarters as a production studio. Brian Clune, CLVS; Jason Levin, CLVS; Gene Betler, Jr., CLVS; and Bruce Balmer, CLVS, presented and captured topics as diverse as what it means to be a legal videographer, the components of a deposition recording system, the CLVS Code of Ethics, and the CLVS Standards for Video Depositions, as well as applicable Federal Rules of Civil Procedure. 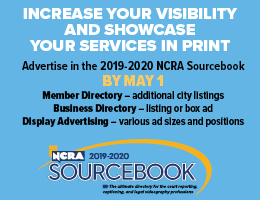 The project is still in its infancy, but NCRA plans to make the online version available by early to mid-2017. The weekend concluded with a number of candidates taking the production exam. For some, it was the culmination of their studies and will result in them becoming newly certified, while for others it was the second step as they prepare to take the Written Knowledge Test in January 2017. Natalie Dippenaar is NCRA’s Professional Development Program Manager. She can be reached at ndippenaar@ncra.org. Online registration for NCRA 2016 Convention & Expo happening at the Hilton Chicago, Chicago, Ill., Aug. 4-7, closes July 29, so hurry and register now to participate in the vast array of networking opportunities, certification preparation workshops for the Certified Realtime Reporter and the Realtime Systems Administrator, and, of course, all that’s new on the Expo floor. 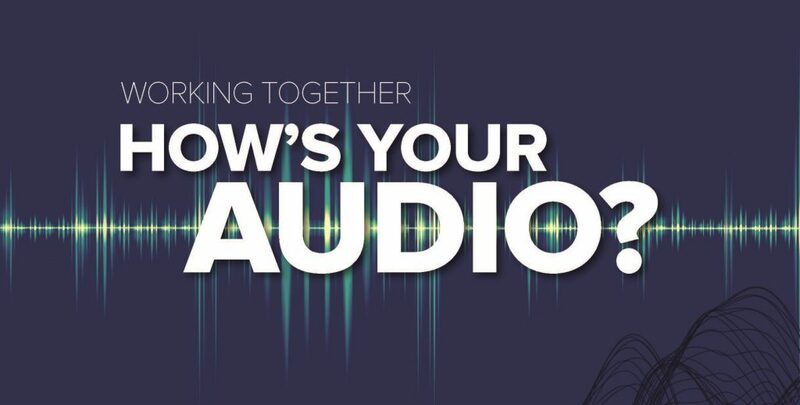 Whether you are an official, freelancer, broadcast or CART captioner, legal videographer, educator, student, or legal services provider, this year’s schedule has something to help you be the architect of your future. Plus attendees who need CEUs can earn up to 2.45 of them with a full registration and optional workshops. In addition, students, educators, and school administrators will enjoy a selection of sessions tailored specifically to their interests and needs. 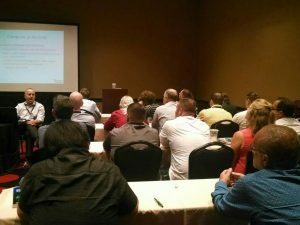 Other highlights for the 2016 NCRA Convention & Expo include professional speaker and humorist address the topic of “Pride in the Profession” when he takes the stage as the keynote presenter during the Premier Session; the national Speed and Realtime Contests; the installation of NCRA’s 2016-2017 Officers and Board of Directors; and the presentation of the Distinguished Service Award, the highest award bestowed by NCRA. Networking opportunities will include receptions, the annual awards and NCRF Angels luncheons, and the President’s Party. Remember, the deadline for online registration is July 29. 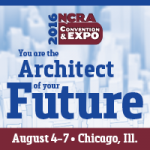 For more information and to register for the 2016 NCRA Convention & Expo, visit NCRA.org/Convention. The NCRA CLVS Spring Event held March 11-13 at the Association’s headquarters in Reston, Va., drew 36 participants for the three-day seminar and 22 candidates for the required test. The seminar, which is held twice a year, is led by some of the best and brightest in the legal video profession. The program provides CLVS certification candidates with skills in video-recording depositions and courtroom proceedings that follow accepted Rules of Civil Procedure. “The CLVS conference was awesome. It was well worth the time and money spent to learn from the experts in the field. 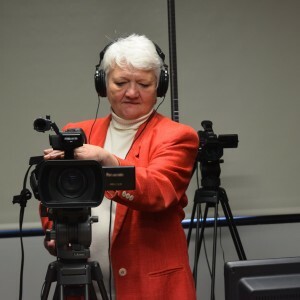 From guidance in assembling your first video kit to how to properly end a deposition, they covered everything from A to Z,” said Andrea Kreutz, a videographer for Huney-Vaughn Court Reporters in Des Moines, Iowa. “The networking session allowed us to meet other videographers from around the country,” Kreutz added. Candidates for NCRA’s CLVS certification must complete a three-step process: attend the CLVS Seminar, pass the Written Knowledge Test, and pass the hands-on Production Exam. Steps two and three can be taken in any order once step one is completed. 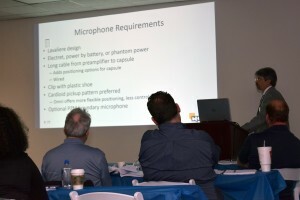 NCRA’s CLVS Spring Event also offered an Experienced Track, which allowed qualified experienced legal videographers the opportunity to attend only the mandatory Saturday session of the Seminar followed by the CLVS Production Exam on Sunday. “I had the pleasure of being one of the instructors in the hands-on section on Sunday. For most of the participants, this was their first time setting up the equipment and actually operating the camera in a mock deposition,” said Jason Levin, CLVS, with the Virginia Media Group in Washington, D.C.
“The feedback I got was extremely positive. In fact, one woman pulled me aside to tell me she felt a bit overwhelmed Friday and Saturday, but by the end of the hands-on training on Sunday, her confidence was at an all-time high and her spirit was greatly lifted. So as far as I’m concerned, mission accomplished!” Levin added. In addition to the seminar’s attendees, eight members of NCRA’s CLVS Council were also on hand. The CLVS Council is made up of a group of experienced legal videographers who volunteer their time and share their real-world expertise when leading the CLVS Seminar, which provides a huge benefit to the candidates who attend. Participants in the CLVS Seminar also experience valuable networking opportunities that can lead to future job assignments. For more information about NCRA’s CLVS certification or to register for next the seminar, visit NCRA.org/CLVS or contact Angie Ritterpusch, Assistant Director of Professional Development, at aritterpusch@ncra.org. Space is filling up for NCRA’s 2016 CLVS Spring Event at the Association’s headquarters in Reston, Va., March 11-13. To date, only five slots are left for the three-day seminar, which is led by some of the best and brightest in the legal video profession. 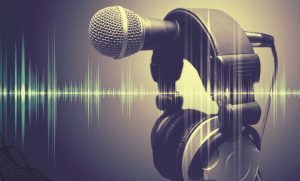 The seminar gives CLVS certification candidates with experience in video-recording depositions and courtroom proceedings a skill level that follows accepted Rules of Civil Procedure. 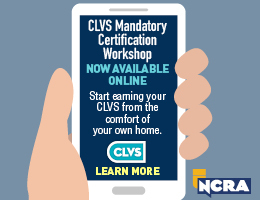 Candidates for NCRA’s CLVS certification must complete a three-step process: attend the CLVS Seminar, pass a written knowledge test, and pass a hands-on production examination. Steps two and three can be taken in any order once step one is completed. Kreutz has been working as a videographer for just over six months for Huney-Vaughn Court Reporters, Des Moines, Iowa. She thinks one of the greatest benefits of attending the Spring Event will be the opportunity to learn from experienced videographers. “I hope we are provided with recommended practices that will make our jobs easier. Also, I hope to learn the best way to educate attorneys on how videography works,” she added. Nicholas Sanfratello, a videographer with Jenson Litigation Solutions, Chicago, Ill., is also looking forward to learning the necessary skills to become a CLVS for his company when he attends the seminar. “Having the certification will mean that I have opened the doors to be a legal videographer and to explore what else I can do with this great achievement,” said Sanfratello, who has just recently entered the videography field. 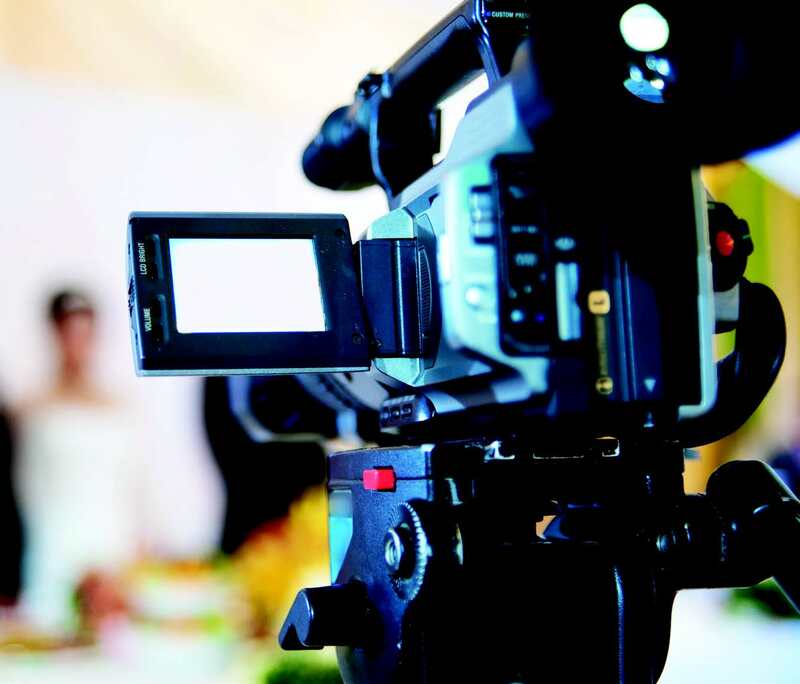 NCRA’s CLVS Spring Event also offers an Experienced Track, which allows qualified experienced legal videographers the opportunity to attend only the mandatory Saturday session of the seminar followed by the CLVS production exam on Sunday. 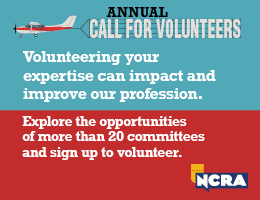 NCRA’s CLVS Council is made up of a group of experienced legal videographers who volunteer their time and share their real-world experience when leading the CLVS Seminar. 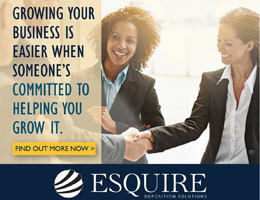 Their vast experience provides a huge benefit to the candidates who attend. Participants in the CLVS Seminar also experience valuable networking opportunities that can lead to future job assignments. For more information about NCRA’s CLVS certification or to register for the upcoming seminar, visit NCRA.org/meetings or contact Angie Ritterpusch, Assistant Director of Professional Development, at aritterpusch@ncra.org.